ISBN 9789043132763. 9x12 inches. English(UK). 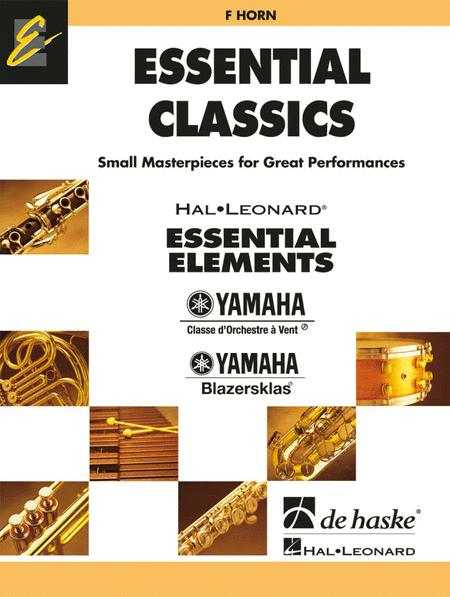 ESSENTIAL CLASSICS is a collection of pieces ideally suited to introduce beginning bands, whether in or outside of school, to the classical repertoire. The easy arrangements make the most popular melodies of all time accessible to young musicians, without the frustration of playing music that is too difficult for them. Now they can enjoy music from instrumental works and operas to oratorios and lieder, from Tylman Susato to George Gershwin. The pieces are arranged in ascending order of difficulty, coinciding with the progress students are making in Volumes 1 and 2 of ESSENTIAL ELEMENTS the complete method for music education in schools and bands. But even without ESSENTIALELEMENTS, ESSENTIAL CLASSICS is an excellent source of repertoire by itself. In addition to the music the individual parts contain short snippets of information about the music, composer and genre, written in a style younger players will understand. The full score contains more in-depth information on the music. No matter how you use ESSENTIAL CLASSICS with your band, your players will love all the fun and engaging arrangements it as to offer. Die deutschsprachige Ausgabe dieser Reihe ist unter dem Titel Blaserklasse Klassik erhaltlich. De Susato a Gershwin, de l'oratorio au lied en passant par l'opera et autres genres, Essential Classics propose une plongee dans l'univers classique. Les arrangements suivent la progression des recueils Essential Elements (Vol. 1 & 2), mais peuvent egalement etre utilises de facon independante. La version integrale de chaque arrangement est disponible sur le compact disc d'accompagnement vendu separement. Sommaire : La Mourisque (Susato) * Le Printemps (Vivaldi) * Musette (J.-S. Bach) * Le gai laboureur (Schumann) * L'Innamorata (Gastoldi) * 2e mouvement du Quatuor << L'Empereur >> (Haydn) * 4e mouvement duQuintette << La Truite >> (Schubert) * Ouverture de Guillaume Tell (Rossini) * Le beau Danube bleu (J. Strauss II) * Trumpet Voluntary (Clarke) * Alleluia du Messie (Haendel) * La lettre a Elise (Beethoven) * Capriccio italien (Tchaikovski) * 4e mouvement de la Symphonie du >> Nouveau Monde >> (Dvooak) * Une petite musique de nuit - 1er mouvement (Mozart) * Danse hongroise ndeg 5 (Brahms) * Land of Hope and Glory (Elgar) * La donna e mobile (Verdi) * Marche Nuptiale (Wagner) * Cancan (Offenbach) * Symphonie ndeg 1 - 3e mouvement (Mahler) * Summertime (Gershwin). ESSENTIAL CLASSICS e il materiale ideale per far familiarizzare le bande principianti o junior con il repertorio della musica classica. Gli arrangiamenti, ideati in ordine progressivo di difficolta, sono ideali per sviluppare le prime conoscenze gia acquisite e rinforzare la capacita di applicazione in un contesto strutturato in maniera pedagogica e motivante. Da Susato a Gershwin, dall'oratorio al lied, passando per l'opera e altri generi musicali, ESSENTIAL CLASSICS propone un'immersione nell'universo classico. La versione integrale di ogni arrangiamento e disponibile sul CD di accompagnamento venduto separatamente.